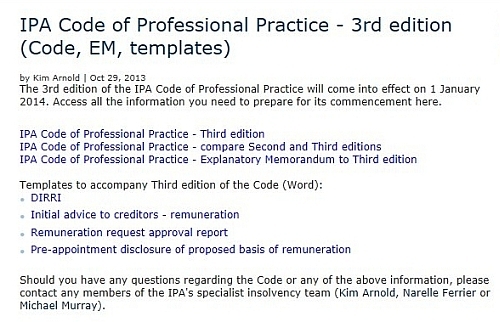 Before accepting an appointment as liquidator or administrator of an insolvent company the insolvency practitioner (IP) must evaluate his or her relationships with the company and with those who are involved or have an interest in its affairs. In the following decision chart and accompanying notes I suggest that there are three main steps in the evaluation process. Step 1 is fairly simple: the task is to ensure that the IP is not prohibited or disqualified from acting by the express laws on disqualification for reason of a specific connection that are contained in the Corporations Act 2001 (the Act), i.e., sections 448C and 532. Step 2 may be far more difficult. It involves looking out for other relationships which the Act deems to be, prima facie, of interest to creditors of the company (sections 60, 436DA, 449CA and 506A). If such a relationship exists, the IP must evaluate whether the relationship is “relevant”. Unless such a relationship is “trivial”, it will be “relevant”. If the IP is of the view that there are no relevant relationship, he or she may accept appointment. (His or her view that there are no relevant relationships must be declared in writing in the Declaration of Relevant Relationships presented to creditors (section 60)). 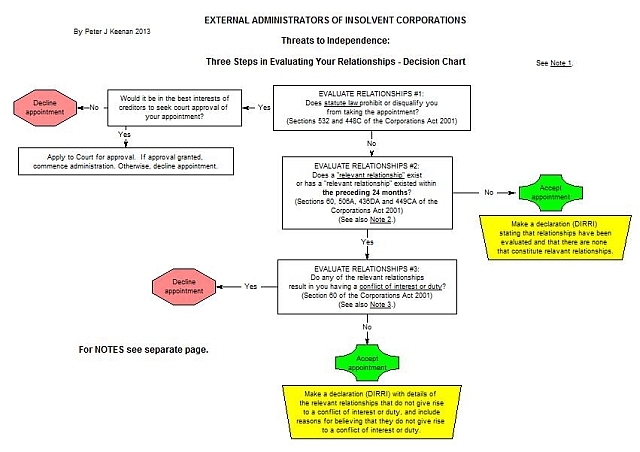 Step 3 in the evaluation process is required if the IP considers that there is a relevant relationship. Relevant relationships need to be evaluated to see whether they give rise to, or are likely to give rise to, a conflict of interest or a conflict of duty for the IP in the performance of his or her obligations. This is a complex issue, which is expanded upon in Note 3. If the IP forms the view that because of a relevant relationship he or she has or is likely to have a conflict of interest or a conflict of duty, he or she must decline to take the appointment. 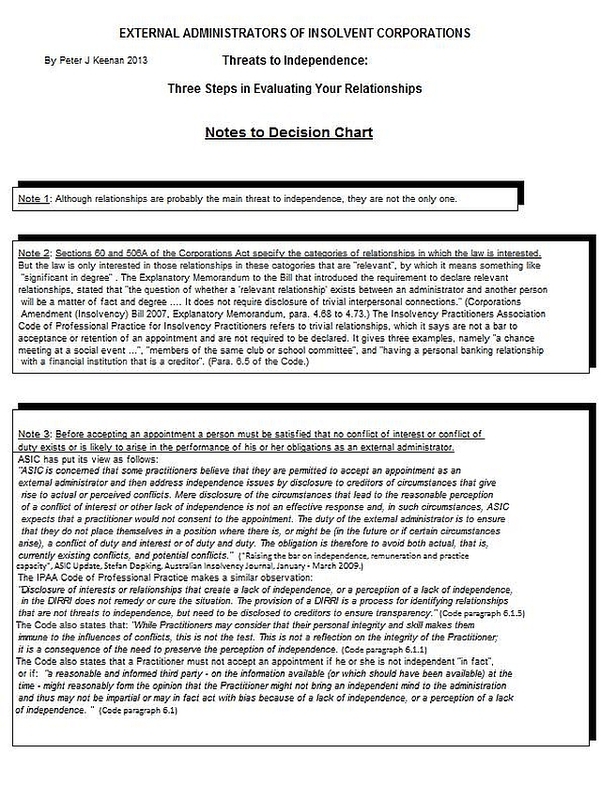 On the other hand, if the IP’s view is that there is no such conflict, the IP must – in the written Declaration of Relevant Relationships – give details of the relationship and explain why he or she believes that it does not and will not give rise to a conflict of interest or a conflict of duty.